Rosalind M. Hewsenian is the chief investment officer of the Helmsley Charitable Trust. She is responsible for the strategic direction of the Trust’s investment program and its implementation. Prior to Helmsley, she was the CEO of Clay Finlay, a global equity firm. Hewsenian has spent the majority of her career at Wilshire Associates in Santa Monica, California, as a senior investment consultant serving governmental pension funds. She was the lead investment consultant to the California Public Employees’ Retirement System (CalPERS). She also served on Wilshire’s board of directors and was an equity principal of the firm. Hewsenian holds an MBA in finance from Pace University and a B.S. in educational psychology from the State University of New York College at Oneonta. Hewsenian was recently named on Trusted Insight’s Top 30 Foundation Chief Investment Officers. She graciously spoke with us on May 1, 2017. In this interview, she discussed how seeing the industry from different perspectives influenced her investment approach, developing a private capital portfolio from scratch and insight on accessing private market deals. Trusted Insight: You've seen the industry from a number of different perspectives: as an investment consultant, as an asset manager and now as an asset allocator. How have those different perspectives shaped your approach to the current portfolio? Rosalind Hewsenian: The benefit of seeing it from different perspectives, understanding and recognizing is that I know where the bodies are buried. As a consultant, I had the opportunity to work with a number of different clients, with a variety of different risk tolerances. That gives you different lenses through which you look at money managers in every asset class, because that's what you do as an investment consultant. I've been on the sponsor side of the business twice. First at Pepsi and now at Helmsley. In those cases, I'm looking through a single lens, which is the risk tolerance of the particular plan sponsor for whom I'm working. By nature, while we've got a wide breadth of opportunity, I don't have the resources that I previously had at Wilshire when I was there. I can't cover the landscape as much as I did before. But I'm far more focused in what I'm looking for, primarily because of the fact that I'm looking through a single lens. When I was on the money management side of the business, I saw the world only according to the focus of the firm I was working for. My scope was quite limited, and I was trying to figure out how to take what I was selling and fit it into the risk profile of a variety of different potential clients. What it really comes down to in this entire industry, as an allocator now, is understanding what really constitutes fit. What am I really looking for, and in all my years of experience, there are a couple of rules of thumb that I've sort of developed that help me in narrowing the list of potential investments out there to something that's manageable and workable. It doesn't matter how many different asset classes I've looked at or how many different money managers I've looked at, there are three characteristics that I've noticed really define success. One is a successful culture within a money management firm, and that starts at the top. The first is identify what your real risk is, and the entire industry has always defined that as volatility or the risk of loss. At Helmsley, I thought about it and decided the real risk we have is liquidity risk. I can withstand a temporary loss of asset value, as long as I don't have to transact. I need to make sure that I can fund the operations of the Helmsley Charitable Trust, and as long as I can do that, then volatility and short-term losses are risks I can certainly bear. That completely redefined my perspective, in terms of what I was looking for from a risk standpoint. It doesn't matter how many different asset classes I've looked at or how many different money managers I've looked at, there are three characteristics that I've noticed really define success. One is a successful culture within a money management firm, and that starts at the top. If there isn't a strong, successful culture -- and that could be defined uniquely by manager, but it's got to be work for that firm -- then the firm will not be successful. T. Rowe Price is an excellent example. The second is that there's a real understanding about size of assets under management, and the ability to generate return. At some point, that relationship flattens out. If you have too few assets, you may not have access to the most successful investment ideas. If you've got too much, you get squeezed out of them. Understanding where that tipping point is and adhering to that is significant. Acadian Asset Management is an excellent example. The third is sell discipline. Very many firms invest correctly, but selling is a completely different skill, and is driven by a completely different set of circumstances than buy discipline, simply because, if for no other reason, after you've made an investment the environment changes. This one is still a work in progress for most managers. Having been on all sides of this business, understanding what risk really means and defining three successful characteristics that drive the success of the money management firm is what I've gotten out of my experience. Trusted Insight: Let's take your first point about liquidity risk. How has that impacted the structure of your portfolio? Rosalind Hewsenian: Once I determined how I can operate the Helmsley Charitable Trust for two years, which is the average length of time of the worst bear market that we've ever seen, then that's allowed me to take far more liquidity risk and get paid for it than I might have otherwise. Trusted Insight: You joined Helmsley only two years after the portfolio's inception date in 2008. A year later, you were in charge of running the whole operation. How has the portfolio evolved over that time? Rosalind Hewsenian: We took over an existing portfolio, because the Trustees hired an outsourced CIO to run the money on a discretionary basis. When we came onboard, we restructured the investment program to fit more with the profile of a large, private foundation, than that of a high net worth individual. At the time, the Trustees were making the determination about the overall risk profile, and as individuals, their risk profile is very different from what it necessarily should have been to ensure that the Helmsley Charitable Trust lasted in perpetuity. With the staff of 12 people, we were able to demonstrate to the Trustees how the fund needed to be managed. We have a depth of organization that allows us to do that. We had to put together a strategic plan, we had to determine what our risk profile was and we literally turned a battleship 180 degrees. The biggest thing is that we had a portfolio of assets that needed to be completely restructured. That was number one. Number two is that we had no private capital portfolio at all. No venture capital, no buyout, not real estate, no private debt, nothing. We developed that from scratch. We managed the J curve in such a way that we never produced, in the aggregate, a negative IRR at any point. While certain investments might have had a negative IRR, in total, we didn't have that, because we led off with secondary investments. We had money coming out of the financial crisis when our peers did not, because our benefactor’s estate was liquidating. We supplied the marketplace liquidity at a steep discount to net asset value. That allowed us to get into private capital without a negative J curve. Trusted Insight: There's not much better timing than that, is there? Rosalind Hewsenian: I'm telling you. You're better to be lucky than right. So, we were very lucky. Trusted Insight: Private markets are all about access. As a new organization, was it hard to get access to private market deals? We were willing to go into new funds created by the top VC managers in an effort to get access to the flagship funds. Going where no one else was going helped too. We went to Israel in 2010. Now everyone else is following us. Rosalind Hewsenian: Venture capital is very hard, but we did a couple of things that were smart. To begin with, we invested with a well-connected, high-capacity venture debt firm, lending to very notable VCs in Silicon Valley. We established our bona fides with them and asked them to introduce us to some of the more competitive venture capital firms. The other is that we were willing to go into new funds created by the top VC managers in an effort to get access to the flagship funds. Going where no one else was going helped too. We went to Israel in 2010. Now everyone else is following us. Thirdly, we went to our peers and asked if they could make introductions for us. To get access, we had to demonstrate that we could bring something to the party as well, and we did. We helped our GPs have eyes on what was going on in the biomedical space, since that is one of our philanthropic areas. That helped considerably. Trusted Insight: Since that is one of your philanthropic areas, do you get better access to investments in the biomedical space? Rosalind Hewsenian: We actually are a by-invitation only shop. While firms may send us emails and call us up, we're actually only transacting where we see value. We invest our private capital portfolio according to themes, and we have a macro strategist who works with our investment team. She's a member of the staff who looks to identify broad themes that answer the following questions: Who wins, who loses and where are the capital gaps? In doing so, that enables us to invest with the wind to our backs. Again, it's another narrowing technique, so that we're not investing everywhere. That allows us to focus our efforts on those funds that fit with our themes. Health care and longevity is a theme for us. Our philanthropic mission has helped, but subtly. Trusted Insight: You have your theme, and that narrows down the pool of managers to a smaller subset, but there's still a large number of managers within that pool. How do you go about identifying a good manager from an elite manager? Rosalind Hewsenian: Go back to the three things that I said were most important. We spend a lot of time talking to them about their business plan. How do they want the business to unfold? That gives us insight as to whether they're deadly serious about understanding how much money they can take under management, and whether they can deploy it successfully. Second of all, we talk to a number of different people within an organization. Again, what we're trying to do is determine the culture. We'll never be able to sit at the investment table to see exactly how they do what they do, but you can actually gather a lot of insight into the culture. If you keep hearing the same thing said the same way, or differently, but implying the same thing, from talking to a number of people in the organization at different levels, that tells you that there's a strong culture that imbues the entire organization from top to bottom. The third is we actually look at investment deals. We try to ascertain why they sold, how they determine when they sold and what drove the sale decision. By trying to understand that, you learn something about the sell discipline. Those who have a very strict sell discipline make it very clear up front. Those who don't, have to dig for it and then ascertain whether it's there and why they're not articulating it. Perhaps they haven't really thought about it and it's a fallout of the rest of the investment process. Trusted Insight: What have we failed to ask about you, about Helmsley or institutional investment in general? Rosalind Hewsenian: Some people have asked: Is it harder today than it was? I would say yes and no. It was harder years ago, because we didn't have access to as much information, but there weren't as many opportunities. Today, there are many more opportunities, and the access to information is easier. So, determining which information is important and which isn't is a big part of our jobs. That's something that's very different. I think the thing that is unique about Helmsley is that we take our missions deadly seriously in investments. We recognize that unlike a lot of other investment organizations buried within foundations, we're not a freestanding island. We're an integral part of the overall organization and we behave that way. I talk to some of my peers and they've never spent any time with their program staff counterparts. They're in their own little worlds, they're own cocoons. We don't operate like that at Helmsley. The investment staff is an integral part of the overall Trust, and that integration has been led by our CEO with my complete and total support. It wasn't always that way, and I think that's what makes us different. 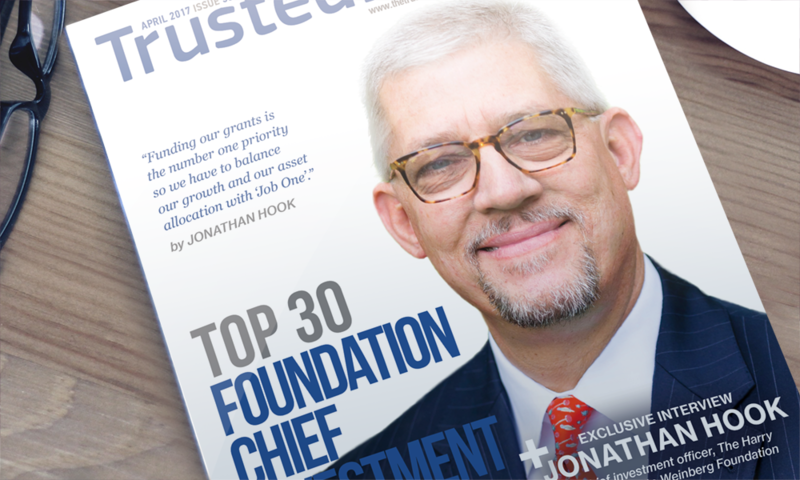 To learn more about foundation investing, click here to view the complete list of Top 30 Foundation Chief Investment Officers.